Under Contribution Limits Increased In 2013, The Caucus Committees Have Collected More Money Than Normal. It Will Be Used In Key Races This Fall. LANSING (APRIL 27, 2018) — The groups that will battle for control of the Michigan House and Michigan Senate this fall continue to stockpile an unprecedented amount of cash. The four committees that raise money on behalf of the House Republicans, House Democrats, Senate Republicans and Senate Democrats reported having $10.0 million available as of April 20, according to new campaign finance disclosures. Their previous high for cash on hand as of April 20 in an election year when both the Senate and the House were on the ballot was $6.0 million in 2014. The fundraising jump is a result, at least in part, of increased contribution limits and increased pressure to raise money. In 2013, state lawmakers doubled all of Michigan’s contribution limits, meaning donors to the caucus committees can now give up to $40,000 per year instead of the previous $20,000 per year. The 2018 election will be the first complete election cycle under the new contribution limits for Michigan Senate races. Senate seats appear on the ballot every four years. Michigan House seats are on the ballot every two years. The 2016 Michigan state House races under the new limits were the most expensive that the Michigan Campaign Finance Network has tracked, costing about $27 million. The four caucus committees raise money that they then pour into competitive districts to try win as many seats as possible.They buy TV ads and fund other efforts to sway voters. The caucus committee with the most money available right now is the Senate Republican Campaign Committee, which reported having $4.3 million as of April 20. 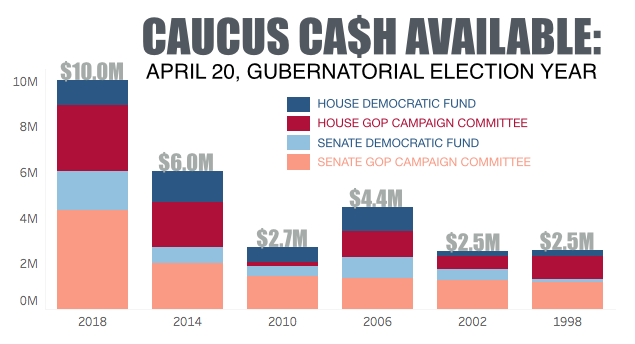 That’s more than all four caucuses had on April 20, 2010 (about $2.7 million). The Senate Democratic Fund reported having $1.7 million available on April 20, 2018, a record for the Senate Democrats who won just 11 of the 38 seats in the Senate in 2014. In the House, the House Republican Campaign Committee reported having $2.8 million available on April 20. Republicans won 63 of the 110 seats in the House in 2016. The House Democratic Fund reported having $1.0 million on hand as of April 20, which is down from their stockpile at this point in 2014 when they had $1.3 million. The following is a list of the top donors to the four caucuses for the last campaign finance period from Jan. 1, 2018, to April 20, 2018. A complete list of the caucus committees’ top contributors is available at mcfn.org/donor-tracking.